European Monitoring Centre for Drugs and Drug Addiction, 2015. The European Union’s drug misuse monitoring centre says the evidence contradicts concerns that facilities where drug users can more safely use illegal drugs might counterproductively encourage drug use, delay treatment entry, or aggravate problems arising from local drug markets; instead both the users and the community benefit. Summary Supervised injecting facilities, and drug consumption rooms more broadly (in some users also take their drugs by smoking or other routes), enable drug users to use their own illicitly obtained drugs under clinical supervision in a hygienic environment. Such centres have been operating in Europe for the last three decades. 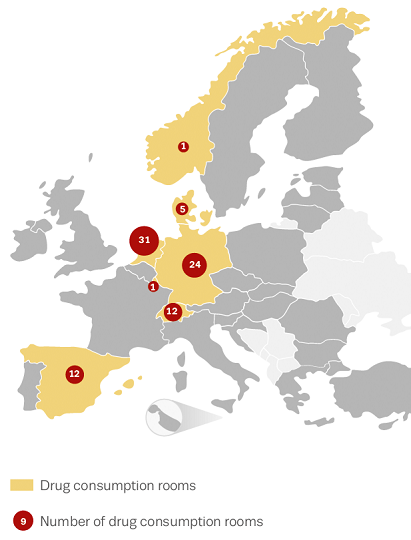 Since 1986 centres have opened in seven European nations and in Canada and Australia. Primarily they aim to reduce the risk of disease transmission through unhygienic injecting, prevent overdose deaths, and link high-risk drug users with addiction treatment and other health and social services. They also seek to contribute to a reduction in drug use in public places and the presence of discarded needles and other related public order problems linked to open drug scenes. By providing an objective overview of their characteristics, current provision, and evidence of effectiveness, this briefing from the European Union’s drug misuse monitoring centre aims to respond to concerns that such centres might counterproductively encourage drug use, delay treatment entry, or aggravate the problems of local drug markets. Drug consumption rooms initially evolved as a response to health and public order problems linked to open drug scenes and drug markets in cities where a network of drug services already existed, but where difficulties were encountered in responding to these problems. As such they represent a local response, closely linked to policy choices made by local stakeholders based on an evaluation of local needs and opportunities. Facilities tend to be located in settings experiencing problems of public use and to be targeted at drug users with limited opportunities for hygienic injection, such as people who are homeless or living in insecure accommodation or shelters. The first supervised drug consumption room was opened in Berne, Switzerland in June 1986. As of June 2015 there were: 31 facilities in 25 cities in the Netherlands; 24 in 15 cities in Germany; 12 in two cities in Spain; one in Norway; one in Luxembourg; five in three cities in Denmark; and 12 in eight cities in Switzerland map. In April 2015 a six-year trial of drug consumption rooms was approved in France and it is expected that facilities will be opened in three cities in the coming months. Outside Europe there are two facilities in Vancouver, Canada and one medically supervised injecting centre in Sydney, Australia [Editor’s note: Correction made to this sentence after consultation with the authors revealed an error with the figures in the original paper]. Features common to most drug consumption facilities, irrespective of location, include restriction of access to registered service users and other access requirements such as a minimum age and local residency. Usually they operate from separate areas attached to existing facilities for drug users or the homeless, though some are stand-alone units. Most target drug injectors, though they increasingly service users who smoke or inhale drugs. The vast majority of services are integrated in low-threshold facilities also offering food, showers and clothing to those who live on the streets, condoms and sharps containers, and counselling and drug treatment. In contrast, specialised consumption rooms only offer the narrower range of services directly related to supervised consumption, which include the provision of hygienic injecting materials, advice on health and safer drug use, intervention in case of emergencies, and a space where drug users can remain under observation after drug consumption. Mobile facilities in Barcelona and Berlin provide a more geographically flexible deployment of the service, but typically cater for a more limited number of clients. Addiction treatment facilities and police have been identified as the main sources of referrals to the centres. Drug consumption facilities reach and retain contact with highly marginalised populations, resulting in immediate improvements in hygiene and safer drug use, as well as wider health and public order benefits. There are reductions in behaviours such as sharing syringes which risk disease transmission and also which risk overdose. Nevertheless, impacts on the spread of HIV and hepatitis C among the wider population of injecting drug users remain unclear and hard to estimate, due in part to the facilities’ limited coverage of the target population, and also to methodological problems with isolating their effects from those of other interventions. Where coverage is adequate, drug consumption rooms may contribute to reducing drug-related deaths across a city. Use of consumption facilities is associated with increased uptake both of detoxification and of drug dependence treatment. Studies have also found overall positive impacts on the communities where these facilities are located and they have generally been accepted by local communities and businesses. Their establishment has been associated with a decrease in public injecting and a reduction in the number of syringes discarded in the vicinity. Where this has been examined in Sydney and Vancouver, in the vicinity of the centres crimes commonly linked to drug use such as thefts and robberies have largely been unaffected. As injecting rates decline, in areas reporting an increase in the use of inhalable drugs such as crack cocaine, facilities that originally targeted only injectors have started to broaden their services to include supervised inhalation. Research suggests that supervised inhalation facilities offer the potential to reduce street disorder and encounters with the police. Drug consumption facilities can reach and maintain contact with high-risk drug users who are not ready or willing to stop using drugs. In a number of European countries supervised consumption has become an integrated component of low-threshold services offered within drug treatment systems. Benefits may include improvements in safe, hygienic drug use, especially among regular clients, increased access to health and social services, and reduced public drug use and associated nuisance. There is no evidence to suggest that the availability of safer injecting facilities increases drug use or frequency of injecting. These services facilitate rather than delay treatment entry and do not result in higher rates of local drug-related crime. commentary This report builds on a 2010 report from the same EU centre which focused on evidence of effectiveness. Informally Britain has had places where injectors were allowed to inject, but in the 1970s these arrangements fell foul of the chaotic behaviour induced by use of barbiturates and gave way to a more therapeutic ethos in the voluntary sector services where injecting had been allowed. In 2013 the former Conservative-led UK government ruled out any return to the practice, saying safer injecting centres were contrary to laws banning unauthorised possession of drugs controlled under the Misuse of Drugs Act. In fact the Act does not make it illegal to allow someone to inject controlled drugs on your premises, though it is illegal to allow their production or supply or the smoking of cannabis and opium. The closest contemporary Britain comes to having safer injecting centres are the few clinics where patients inject legally prescribed heroin under clinical supervision. These clinics have to exercise the same sort of monitoring of patients and have the same capacity to respond to overdose incidents as safer injecting centres in continental Europe, Australia and Canada, providing an experience- and skills-base for such centres in the UK. Whether safer injecting centres are accepted in the UK will probably depend largely on the degree of distress and nuisance caused by public injecting and the degree of concern over the concentration of overdose fatalities in certain localities. In Vancouver in Canada, acceptance of the facility was generated by the highly visible and, to local residents and workers, distressing and objectionable presence of public injecting and injecting-related litter. Both these concerns it helped reduce, consolidating public support. In Australia, despite the highly controversial history of the centre in Sydney, in 2013 most people (54%) who had never injected a drug were nevertheless in favour of such facilities. Around the centre residents and business staff became more supportive of the facility (78% and 63% were in favour) after it opened and injecting-related nuisance declined (1 2). The impacts of these centres seem highly localised, meaning in turn that they suit a situation where public injecting and overdose risk is highly concentrated in a small area, perhaps one where users are drawn because of the availability of drugs. It is unclear whether the UK any longer has areas of this kind which stand out to this degree and where the level of nuisance and risk is so great that an injecting centre would not just be tolerated, but welcomed by residents and businesses. If the problems are more widespread in a city, not just one, but several injecting facilities will be needed to make an appreciable difference, allied with other initiatives such as needle exchanges, improved treatment access and anti-overdose programmes involving naloxone distribution. Though individuals who might otherwise have died will have been saved, even within the neighbourhood, the effect of a single small and limited facility may (as in Sydney in Australia) not be noticeable at the population level. In Germany a study found reductions in drug-related deaths relative to the national average in four cities which opened drug consumption rooms, but in two of the cities this occurred only after the opening of a third or fourth facility. In larger cities, only opening several conveniently located facilities with suitable opening hours and sufficient capacity can be expected to noticeably dent the death rate. The same limitation applies to their longer term lifesaving impact via reductions in the sharing of injecting equipment contaminated with infectious diseases such as HIV. However, in one sense localised impact is a virtue because it means there is no ‘honeypot effect’; few injectors travel any distance to use such facilities, so the locality does not suffer from an even greater concentration of drug dealing and use which might threaten support for a centre’s continued operation.